What is it about? 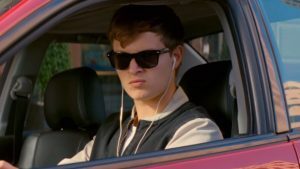 Baby Driver follows Baby, played by Ansel Elgort, a young getaway driver, who always listens to music to drown out the constant ringing in his ear from a childhood car accident. 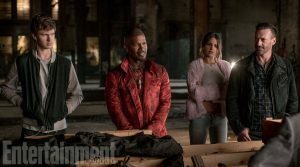 He is forced to do a job for crime mastermind Doc (Kevin Spacey), alongside criminals Buddy (Jon Hamm), Buddy’s wife Darling (Eiza González), and Bats (Jamie Foxx). Meanwhile, he has plans to run off with a waitress named Debora (Lily James) that he just met. How is it? 9.6/10 Baby Driver is a phenomenal, often hilarious, action-packed movie that utilizes music in all the best ways to provide for one of the best films of the year. Just a DISCLAIMER: Baby Driver is Rated R for violence and language. The Ups First off, the use of music here is wonderful. Music is integral to Baby Driver, as Baby is always listening to music, so every single action or movement is carefully choreographed to the songs in the soundtrack. The entire movie is seen through this lens of Baby listening to music, which in my opinion, is really cool. By the way, the soundtrack for this movie is just great! It has lots of really good 70s and 80s songs, which are used to awesome effect in the film. Baby Driver is directed by Edgar Wright. I’m a huge fan of all his previous work- they are all extremely well-directed, kinetic, hilarious movies. His editing style and flair work super well in those movies and they show through here. The editing here is superb, especially during the many car chase scenes. The cinematography is very fluid and benefits the already fantastic chase sequences. This movie is so stylish. I can’t emphasize just how cool it all is: whether it’s the sharp editing or colorful characters, the film has tons of style. Speaking of which, the characters in this and the performances behind them are great. Ansel Elgort is does really well as Baby, who is well-developed, but barely speaks. Ansel does a great job still conveying emotion, even though Baby rarely talks. Jamie Foxx has a ton of fun with his role and is delightfully crazy as Bats. Kevin Spacey has some really funny lines and gives an excellent performance, as well as Jon Hamm. The romance here works nicely. Lily James and Ansel Elgort have endless chemistry and a believable, sweet romance. The action in Baby Driver is just spectacular. All the car chases and action set pieces are done with very little CGI, which is really impressive. These scenes are nothing short of thrilling and are some truly great car chases. Although this film isn’t as much of a comedy as Edgar Wright’s Cornetto trilogy or Scott Pilgrim vs the World (would highly recommend both! ), it’s still a very funny movie. There are some great one-liners all around and many hilarious moments. The script is impeccable as well, boasting both lots of funny parts and emotional moments. Additionally, the emotion in this movie hit harder than I thought it would. It was very real at times, and I ended up sympathizing with characters more than I thought I would. The Downs If there is a single nitpick I can make with this movie, it’s the length. The movie feels just a tad bit long at the end, but it’s barely a problem. Overall, Baby Driver is a unique, fun, stylish, and well-acted film. 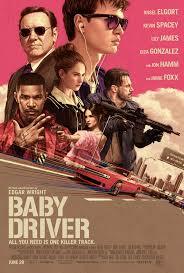 It has great characters, really funny lines, stylish direction from Edgar Wright, stunningly choreographed car chase scenes, and an inventive use of music. Baby Driver is one of my, if not my favorite movie of the year so far. I’m always up for a nice car chase. Thanks for the review. I’ll look forward to seeing this one.